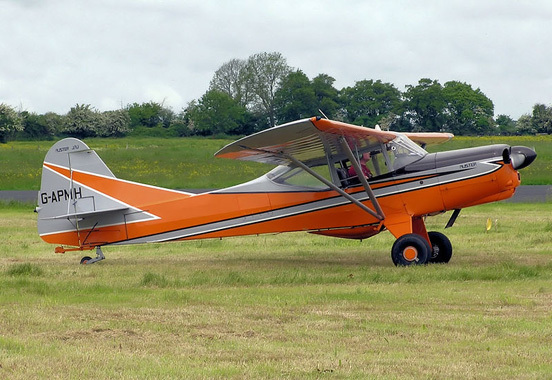 The Auster J/1U Workmaster is a late 1950s British single-engined single-seat high-wing agriculutural monoplane built by Auster Aircraft Limited at Rearsby, Leicestershire. Of traditional high-wing layout, it carries 90 gallons of spray fluid in a tank beside the pilot, an extra seat being provided for a passenger. The Lycoming 0-360-A engine of 180 h.p. driving a McCauley v.p. propeller giving it ample power; and slotted ailerons and balanced tail controls providing good handling. Oversize tyres were fitted. Take-off run at 2,550 lb gross weight and cruising speed at 65 per cent power are respectively 180 yd and 88 m.p.h. Britten-Norman spray gear was provided by Crop Culture, and this company ordered nine Workmasters. Following the experience of developing the J/1B Aiglet agricultural aircraft, Auster developed a more powerful successor the J/1U Workmaster. 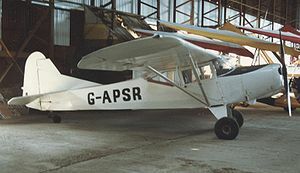 Using the basic Autocrat fuselage it was strengthened and had dorsal fin fillets added, low pressure tyres and a 180 hp (134 kW) Avco Lycoming engine. The aircraft were fitted with Britten-Norman rotary atomizers for crop spraying and a 100 imperial gallon (455 litre) chemical tank in the fuselage. An emergency dump valve allowed the tank to be emptied in 5 seconds. The Workmasters were mainly operated in West Africa, three later returning and are currently (2009) on the U.K. civil aircraft register.